Emilio Estefan, Quincy Jones, Gloria Estefan, Rita Moreno, Dionne Warwick, Cafe Tacvba , Alejandra Guzman, Beto Cuevas, Paul Williams, Diego Torres, and many more formed part of this magical evening. Miami, FL. 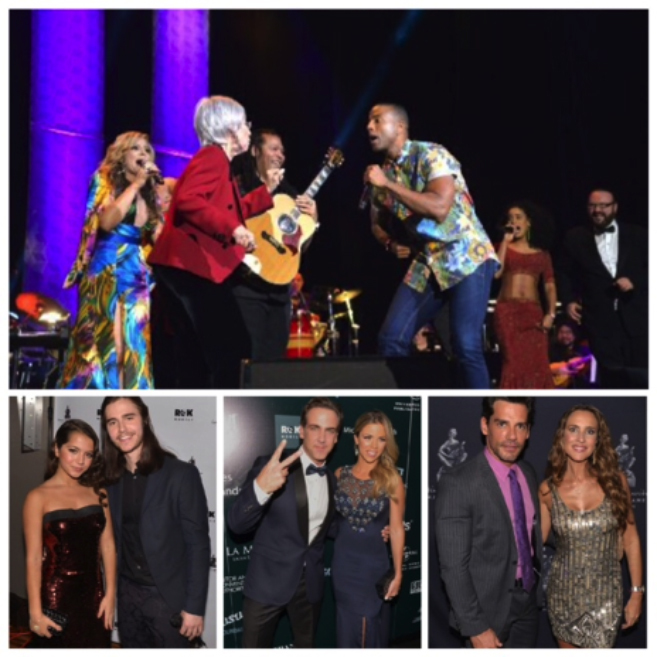 (October 16, 2015) – During last night’s 3rd annual gala of the Latin Songwriters Hall of Fame, LA MUSA AWARDS®, at The Fillmore Miami Beach Jackie Gleason Theater, some of the most relevant songwriters of Latin music were honored by artists, composers and other music industry professionals. From the posthumous tribute to Joan Sebastian, Juan Carlos Calderon, Jose Fernandez, Maria Grever, Chabuca Grande, Paco de Lucia, and Cesar Portillo de la Luz, to the grand finale where a star-studded-line-up of artists, including Horacio Palencia, Yotuel Romero, Amaury Gutierrez, Anthony De La Torre, Isabela Moner, Carlos Ponce, Fantine, Marlow Rosado and Lena Burke, set the stage with a tribute to the Song of All Time GUANTANAMERA. The ceremony hosted by the actor, singer, composer, conductor and TV presenter, Carlos Ponce, brought together on stage, some of the greatest music artists, in an emotional and magical night. (Full list of guests and honored artists at the end). The award show kicked off with the amazingly talented singer Vanessa Campagna who performed a medley of songs in honor of the Posthumous artists. Vanessa has shared the stage with highly acclaimed country artists such as Reba, Sugarland, Trace Adkins, Blake Shelton, Alan Jackson, Brooks & Dunn, Loretta Lynn and Keith Urban. She has also been selected as the 2015 WorldArts featured artist. The most important and influential composers of Latin America were honored during this great celebration. The first composer to be inducted to the Latin Songwriters Hall of Fame last night was Alvaro Torres, who received the award from the Ministry of Foreign Affairs of El Salvador, Hugo Martínez and actress Adriana Cataño. In addition, Torres performed a medley of his greatest hits, including songs like “Ni Tú Ni Ella”, “Hazme Olvidarla”, “Nada Se Compara Contigo”, “Te Va A Doler” and “De Punta A Punta”. One of the most important moments of the evening was when legendary musician, arranger, composer and producer Quincy Jones received the Desi Arnaz Pioneer Award from Dionne Warwick, who performed with Jon Secada “We Are The World”. Mary Megan Peer did the honors of presenting the Editors Award to José Perdomo. Beatriz Luengo, Gian Marco and Victor Manuelle performed Diego Torres hits, “Tratar De Estar Mejor”, “La Ultima Noche” y “Hoy Es Domingo.” Diego who was one of the composers inducted to the Latin Songwriters Hall of Fame, sang one of his international hits, “Color Esperanza”. 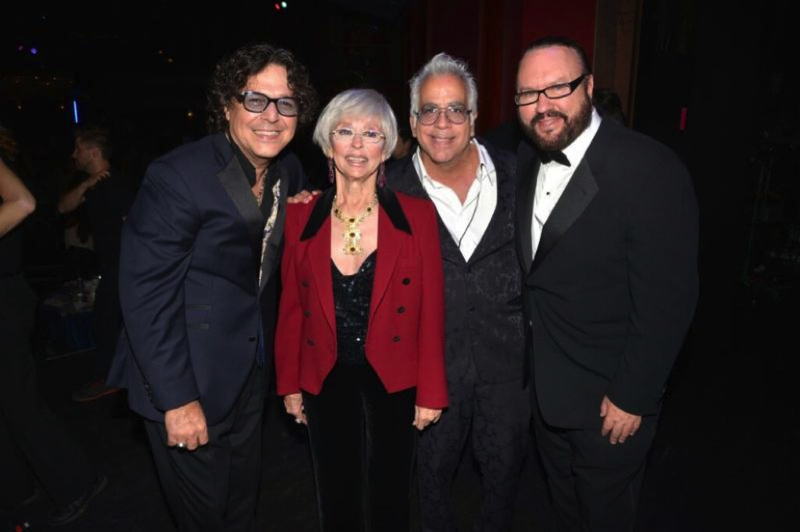 Desmond Child and Rudy Perez, founders of the Latin Songwriters Hall Of Fame, presented the Founders Award to renowned music business executive John LoFrumento, and then the great composer Omar Alfanno took the stage to perform “Irónica”. Up and coming singer Anthony De La Torre and Nickelodeon star, Isabel Moner, were in charge of presenting Fonseca, the Champion Award (Premio Triunfador) , Fonseca performed a medley of his songs “Entre Mi Vida Y La Tuya” and “El Camino De La Vida”. After his performance, Fonseca presented the award to the Colombian composer Héctor Ochoa Cárdenas, who was also inducted to the Latin Songwriters Hall Of Fame. Actor Rene Lavan was in charge of presenting the award to Myriam Hernandez, who was also inducted to the Latin Songwriters Hall of Fame this year. The Chilean singer-songwriter, performed a medley of her hits “Herida” and “Huele A Peligro”. Chilean actor and host, Cristian De La Fuente, presented the Conqueror Award (Premio Conquistador) to his friend and fellow countryman, rocker Beto Cuevas, who later performed his song “Vuelvo”. La Musa Awards stage was electrified when The Queen of Rock, Alejandra Guzmán, received the Elena Casals Award from Grammy winner and former recipient of the Elena Casals Award, Marlow Rosado. The “Queen of Rock” was elated with the award and performed her hit song “Día De Suerte”. Another notable moment was when the multifaceted American composer and singer, Paul Williams, presented the multi awarded composer and producer, Gustavo Santaolalla, who was also inducted to the Hall of Fame. The legendary Mexican rock band, Café Tacvba, went on stage to perform “Vecinos” and were surprised when Santaolalla, presented them the Icon Award. The iconic Puerto Rican actress and singer, Rita Moreno, received the Legacy Award from her fellow countrywoman, singer Ednita Nazario, and after an emotional speech, Rita performed the song “Somewhere” in Spanish. At the end of the night, Gloria Estefan took the stage to perform the classic “Con Los Años Que Me Quedan”. Following her performance Univision Networks renowned and respected news anchors, Jorge Ramos and Maria Elena Salinas presented Emilio Estefan with La Musa Award. Emilio was another of the legendary composers to be inducted to the Latin Songwriters Hall of Fame. 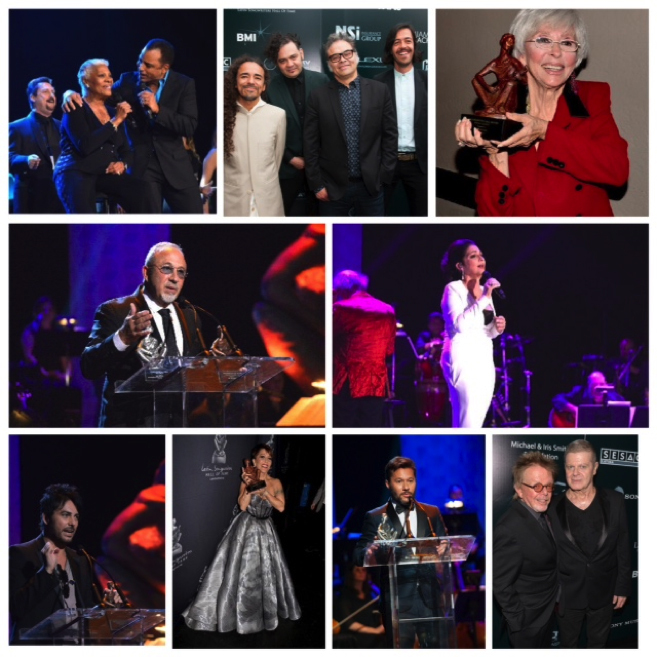 The 2015 LA MUSA AWARDS was staged by a director whose list of accolades is a who’s who of music and stage. Cuban-American Richard Jay-Alexander. The 45 piece La Musa Orchestra was conducted by Maestro Eduardo Marturet of the Miami Symphony. La Musa Awards was presented by WorldArts (WorldArts.com), in collaboration with Miami Beach Visitor and Convention Authority and The City of Miami Beach. The Latin Songwriters Hall of Fame is a 501c3 non-profit organization founded in 2012 by renowned songwriter/producers Desmond Child and Rudy Pérez whose mission is to educate, honor and celebrate the lives and music of the world’s greatest Latin Songwriters and composers and inspire new generations of music creators through master classes, workshops, scholarships and digital initiatives. WorldArts is the premiere global resource for artists to connect directly with fans, brands, and industry professionals. We offer artists live performance opportunities and an e-commerce platform to sell and license their music so they can monetize their career. Our crowdfunding platform allow fans to share in this journey by helping artists tour and continue producing their music. Fans are also rewarded with exclusive offers and can share content so they can be a part of finding the ‘next big thing’. Our mission is to bring the music world under one roof and make it a better place for everyone. At WorldArts… it’s all about the music.